In advance: You want to cook steak at room temperature, so take out of fridge at least 15 minutes before cooking. 1. Preheat heavy skillet over med-high heat. 2. Remove steak from marinade and pat as dry as you can with paper towels or a very clean dishtowel. Brush steak with very thin layer of canola oil. 3. Drop steak into hot dry pan. For 1 inch thick steak to cook medium rare, cook approx 4 minutes per side. Less for thinner, more for thicker. Less for rare, more for more well done. Do not move steak in pan while cooking. Keep flame as high as you can without burning the oil and causing the pan to smoke. Note: You will want to turn off the heat while steak still has some cooking to do. It will continue to cook while resting in the pan. See steak temperature chart for details on when to take steak out for rare, med, etc. 4. Take the pan off the heat and cover loosely with foil. Let steak rest in pan 5 minutes. 5. Take steak out of pan and slice into thin strips. Cover with foil. 6. Heat heavy skillet and add very thin coat of oil. 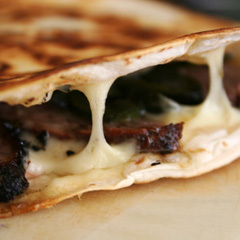 Place tortilla in pan, cover with 1/4 of shredded cheese, and 1/4 of steak. Cover with another tortilla. Cook until lightly browned on bottom and cheese is starting to melt. Flip over and cook on other side until cheese is completely melted. 7. Repeat with remaining tortillas, steak and cheese. 8. Serve with sour cream and salsa fresca. This entry was posted in Hispanic, Recipes and tagged monterey jack, quesadilla, steak, tortilla. Bookmark the permalink.